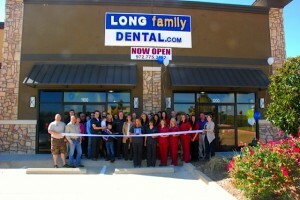 On Friday, November 2, 2012, Long Family Dental celebrated an open house at our new location in Midlothian, TX. The Chamber of Commerce brought the ribbon and scissors and our entire team was there for the event. We had many other Midlothian businesses come out and several people from the medical and health community to welcome us! B’s Texican provided some awesome food as well! Our Midlothian office has many amenities to offer for both patient education and comfort. Just like in our Cleburne office, we have digital radiography which allows us to take x-rays with much lower radiation. Both offices also offer intra-oral cameras so patients can see their own dental conditions up close and personal. In our Midlothian office, we also have a Hospitality Menu including Netflix movies, XBox, television, music and other items to make our patients as comfortable as possible. You can even bring your own DVD’s! We hope you will come out to see our Midlothian office and even make an appointment if this is a convenient location for you.